Students draw and paint a barn in an autumn landscape using pencils, pens, and watercolors. Teaches perspective for the barn and the background. 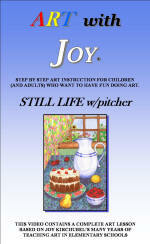 Shows how to represent foliage on trees and bushes. 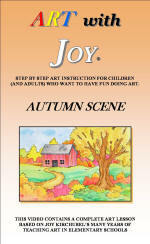 Demonstrates a watercolor wash for the sky and blending colors to create beautiful fall foliage. Students draw with the video and color in another session on their own. 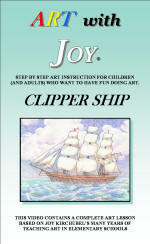 Teaches how to draw a square rigged clipper ship. Discusses the clipper ship’s special place in history including the China tea trade and the California gold rush. 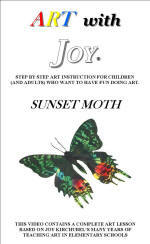 Encourages children to create an imaginative background. 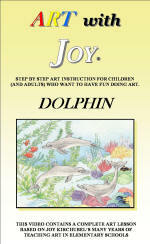 Discussion of dolphins and their wonderful characteristics, as well as the threats to them and possible solutions. Drawing dolphins and their underwater habitat including coral, kelp, sea fans and fish. Coloring with crayons or colored pencils, blending the blues of the ocean so the lightest color is at the top (where sunshine would make the ocean appear lighter). A fantasy drawing - Teaches blending colors with crayons, perspective in landscape, shading for distant objects and drawing and coloring clouds. 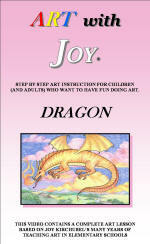 Encourages kids to use their imagination for the dragon and in creating wonderful backgrounds. 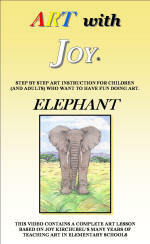 Teaches how to draw and elephant. Tips on blending color with crayons and background perspective discussion. Endangered species discussion - Elephants and their habitat and characteristics. Students draw and paint an Angel Fish in a simple underwater scene using pencils, pens and water colors. Lesson teaches many basic facts about fresh water angel fish and the environments in which they live. Lesson reviews how to paint with water colors, how to blend and layer colors and how to mix a light blue for the background. Works well as two sessions - students draw with video, paint the background with the video and continue painting on their own. 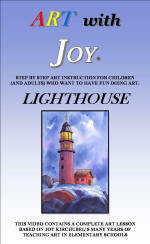 Teaches children to draw a lighthouse on a hill or cliff and finish their drawings with black fine line pens. They paint the scene with a watercolor wash for the sky, creating a stormy dramatic look. Discussion of lighthouses - their history, purpose and workings. 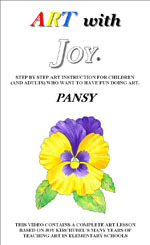 Students draw and color a lovely pansy using pencils, pens and water colors or colored markers. Students learn to begin with a circle for the basic shape and gradually change it into the fine curving petals radiating from the center as well as the pretty leaves and ruffled edges that represent the soft texture of the petals. The pansy demonstrated in the lesson is painted with water colors and there are many samples shown of pansies in both water colors and colored markers. A fun drawing with pencil and fine line pen of various things sitting on a table. Children add more things to the table if they want to, design any background they like and color their picture with any medium they choose. Drawing the moth with black maker pen and painting it with water colors. Watercolor techniques; allowing colors to blend together as they do on the month. Endangered species discussion - mother and their function - anatomy of the moth.